Unlike other past dips in driving, this recent downward shift has had no clear, lasting connection to economic trends or gas prices. Evidence suggests that the decline is likely due to changing demographics, saturated highways, and a rising preference for compact, mixed-use neighborhoods, which reduce the need for driving. 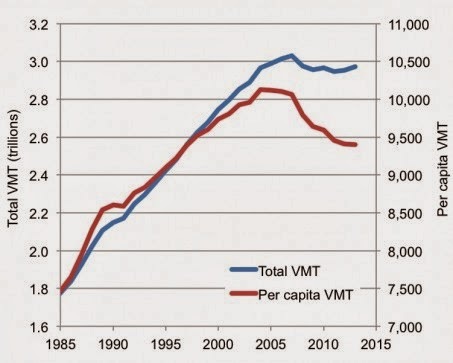 Some key factors that pushed VMT upward for decades – including a growing workforce and rising automobile ownership – have also slowed considerably. SSTI released a report last September outlining the many contributing factors, with references to supporting literature.